What makes the lily interesting is a six-petal appearance of it. In the Hebrew language, the female name Susannah (hbr. Shoshannah), the lily flower (hbr. shoshana) and the number six (hbr. shesh) are possibly from the same root word. The lily is often presented with another plant that is dear and meaningful for the people in the Near East and in India, i.e. the pomegranate fruit (punica granatum1). Especially in Israel, the pomegranate often has six petals first on the flower development stage and consequently at the other end of the fruit’s life span, as a ripe fruit, a six shaped persistent calyx or crown is formed. Lilies (as different types of palmettes) and pomegranates are both almost exclusively present on the ancient hybrid Tree of Life illustrations, and they are common among buried funerary items. According to the Books of Kings2, capitals of the two pillars that stood in the front of Solomon&apos;s Temple in Jerusalem were engraved with pomegranates and lilies. Two pillars in the temple of Solomon made of silver and gold (pillars of cloud and fire) represent a similar change in light and darkness. In the book of Judges, the Samson (day) was taken over by Delilah (night, de&apos;lily&apos;h), but after a while, Samson took over Delilah again by breaking apart the two pillars of the temple of the fish-god Dagon3. Gold bells and pomegranates were attached to the hem of the robe of the Jewish High Priest, as we can read from the Exodus4. There is evidence that the six-spoked pomegranate was used as a religious symbol in Israel already in the 14-13th century BC. 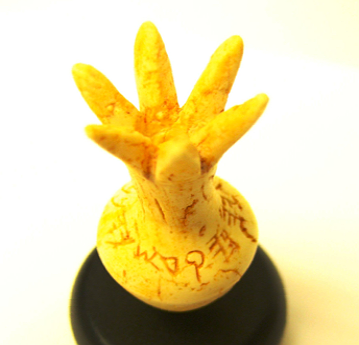 The picture 5.5.1 is a thumb size object made of ivory representing the pomegranate5. 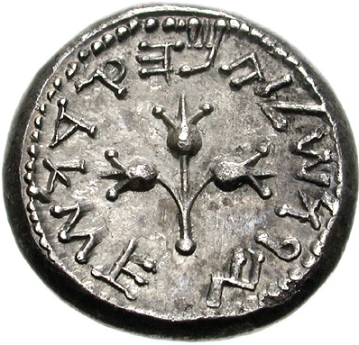 The picture 5.5.2 is a reverse side of a coin issued by the Jewish rebels in 68 AD6 and it has three pomegranates in the middle of it. The Shoshanim had to be full-size as seen from above, that is six-petalled, as the pillars stood free in front of the Temple, while the capitals of the two engaged pillars in the vestibule had to be tri-petalled, as seen from the side. 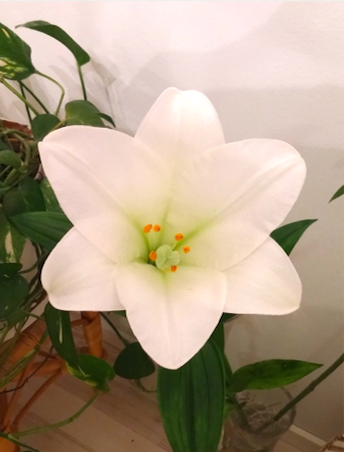 In its six-petalled form, as well as in the tri-petalled side-view, the Lily came to be the paramount ornament of Jewish art and especially of Jerusalem’s ossuary decoration. 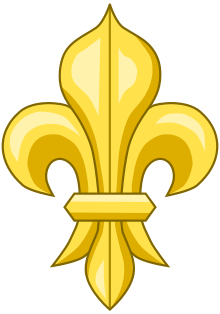 Harum-scarum or just provocative, Pope Paul VI (1968-1978) was entitled "Flos Florum" or Flower of Flowers and his coat of arms contained three lilies (see Fleur-de-lis in the picture 5.5.3 above and at the top of the head of the winged genie on the picture 4.2.4), again resulting in 6+6+6. A small clarification here might be in place. My intention is not to agitate hexakosioihexekontahexaphobia. Through careful analysis, religious-mystic history seems to show, that 6, with its multiples, was not considered exclusively evil, bad, or unlucky. Rather, it should be regarded similar to a dancing seed in the Yin-Yang symbol, where opposites relatively oscillate relative to each other and alter their positions constantly. 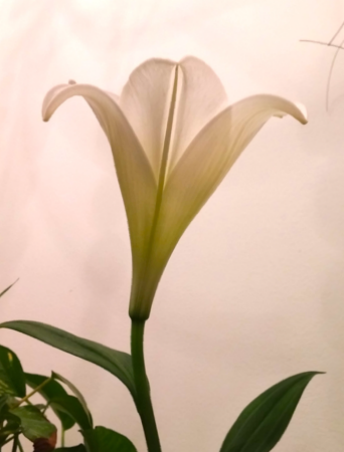 Below, we can see lily flowers from the side (picture 5.5.4) and the top view (picture 5.5.5). These pictures further visualize the idea of six originally being the original three plus the mirror of three together. The Greek mythology shares the very same mysticism for the number six. Hera, a very prominent figure in the ancient Greek art, is said to have held the pomegranate and the lily in her hands. Boeotians called both the lily and the pomegranate with the same name: sida/side8 giving a name to the famous fermented pear/apple drink and the ancient town in Antalya, Turkey. Both the pomegranate and the lily were called "water plants". In Ethiopian and Western Slavic languages numbers six and seven starts with a "sid-/sed-" phonemes which might intermix the numerical connection with these two plants9. Moreover, Persephone10, on her trips between the two worlds, finally ate six seeds of the pomegranate, although the number of seeds varies in different versions of the story. Seasons of the year are said to correlate with her coming and going so that during the six autumn/winter months Persephone lives down with Hades / Pluto and during the six spring/summer months she makes the Earth bloom with Demeter. Cyclical association of the pomegranate fruit is discussed, for example by, Matt Bennett in his journal article: The Pomegranate: Marker of Cyclical Time, Seeds of Eternity11.